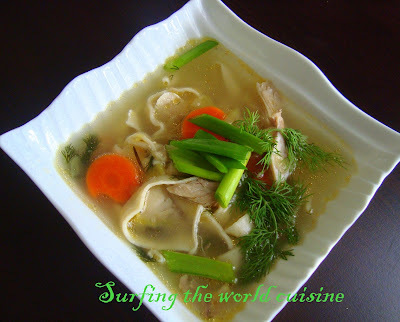 It's getting colder in Istanbul and it is really the time to cook warming chicken soups. For Lithuanian version join me on Facebook. 1. Put chicken into a pot with water. When it starts to boil remove extra fat. 2. Then put garlic, rosemary, thyme, dill and bay leaves. Boil for 20 minutes. 3. Remove the herbs and add carrot, season with salt and pepper. 4. When carrots get soft, remove the chicken breast and add cabbage and noodles. Cook for 8-9 minutes. 5. Cut chicken into small pieces and return to the pot. 6. When the soup is ready add some fresh dill and some spring onion ( optional). Enjoy!!! It's soup weather here in Texas too! What a beautiful photograph. I'm sure that soup tastes as good as it looks. It was in the low twenties for us today - will definitely be making soup!